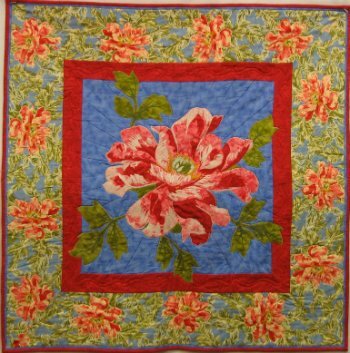 I believe quilting is a journey for anyone. We all begin and learn as we go. 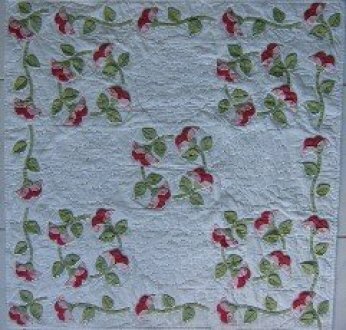 I hope you will enjoy visually viewing a sampling of my quilting journey through time. 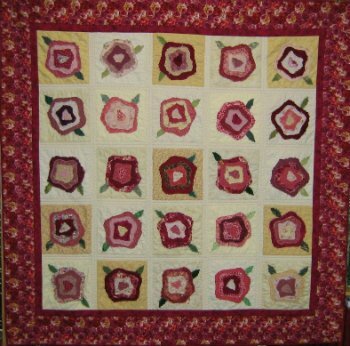 Nova's Gallery of Quilts, Blocks, etc. 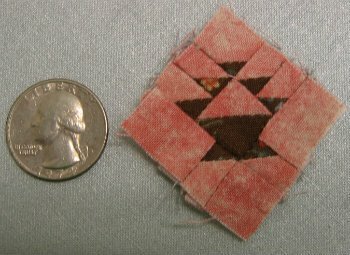 I took a beginning quilting class in the early 1980's. Then jumped in and made my mother and my husband's mother full size quilts for Christmas - all hand pieced, hand appliqued, and hand quilted. My mother's was blue. His mother's is pictured here in brown. This quilt was made for my daughter, Brittany. She loves to read and is an academic at heart. The open books of this Thimbleberries pattern suited her nicely. 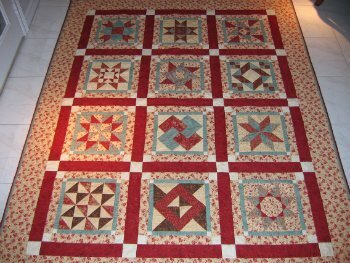 It is also entirely hand pieced and hand quilted. Near the end of my piecing this quilt (while I was cutting out the borders as I remember it) someone mentioned a rotary cutter to me. What an invention! During my daughter's senior year of high school, I began this Cathedral Windows quilt. Again, it is entirely done by hand. She assisted with the layout of colors and fabrics; that engineer's brain kicking in. 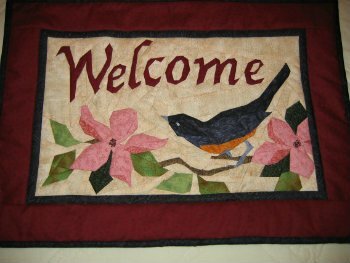 I fell in love with needle turn applique after taking a workshop from a professional. 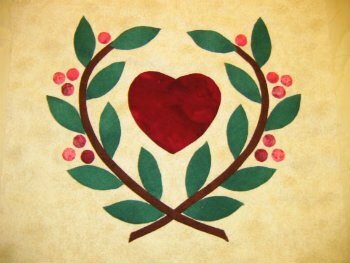 This is an original pattern I designed while living and teaching in upstate New York. Also while in upstate New York, I became active in the local quilt guild and participated in their monthly block challenge. This was my first experience with paper piecing shortly after my husband gave me my Featherweight for Christmas. Your favorite movie using only two fabrics. 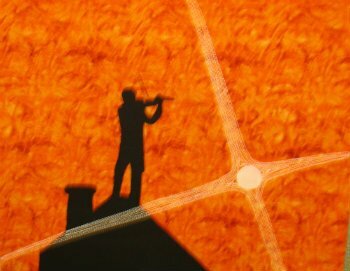 The orange and black were my fabrics, the sun rays are thread painted with my Singer Featherweight. I loved this block! 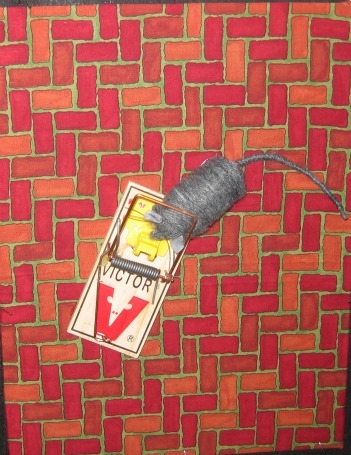 My friend Marge won the drawing for the blocks that month. 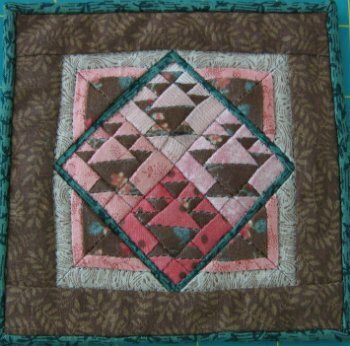 After moving back to Texas, and becoming active in the Tall Pines Quilt Guild, I began to take advantage of the classes offered by teachers coming to the guild. This was a workshop by Cynthia England. 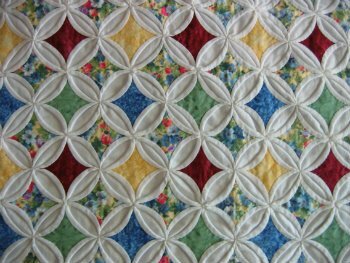 The Fabric Carousel offered a block of the month. 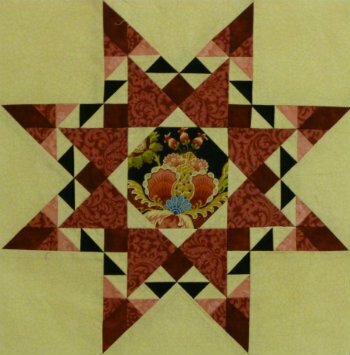 I participated in the program and made this quilt that I named "Fruits of a Featherweight Fanatic". It is queen size, and entirely pieced and quilted on my Singer Featherweight. The Fabric Carousel also offered a challenge each year. 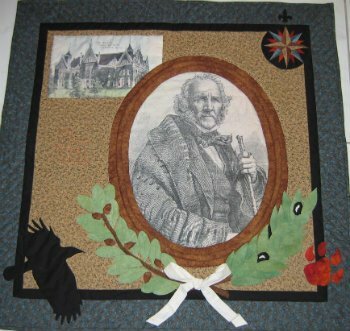 This quilt was an entry in one of those challenges and won viewer's choice. Huntsville, TX was the home of Sam Houston, a very important figure in Texas history. The challenge rules gave the participants four fabrics (the orange, the teal, the tan and the marbled brown). We could only add three additional fabrics. I added a muslin that I dyed and printed, the black and the lighter teal in the miniature mariner's compass. Another Fabric Carousel challenge quilt. This won first place from the judges. I took one of the flowers from the designated fabric, enlarged it, and thread painted it. 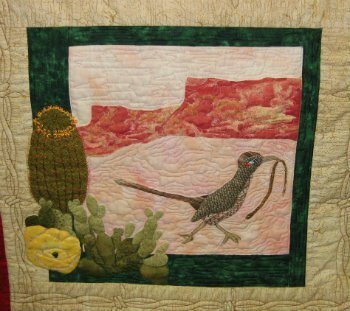 An intricately appliqued and embroidered block for the local guild's donation quilt. I've learned a lot and stretched my boundaries by participating in challenges and guild projects. My first exploration into dimensional applique. 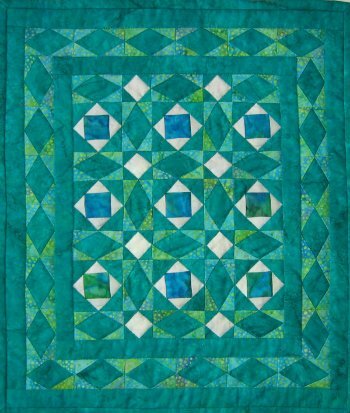 This is a miniature Storm at Sea quilt made to commemorate a trip to Laguna Beach. 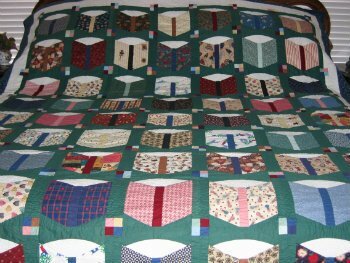 As a part of the Airing of the Quilts Festival held by Tall Pines Quilt Guild, the Fabric Carousel issued a miniature "memory quilt" challenge. Miniatures were intriquing me. 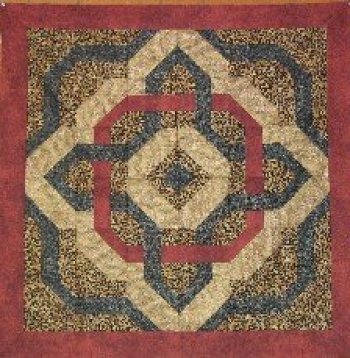 I was working through Sally Collins book on precision piecing. I had no idea what the size of this block would be when I began it. Here is the entire quilt. It is 3 inches square!! 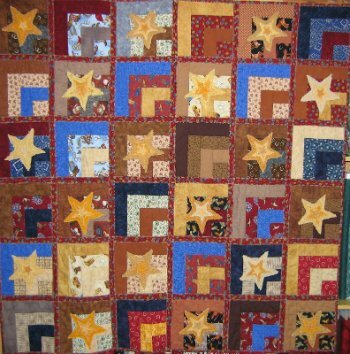 This is 6 inch Feathered Star block that I believe has 121 pieces. There are 16 of these completed blocks that are awaiting assembly. Precision piecing!!! 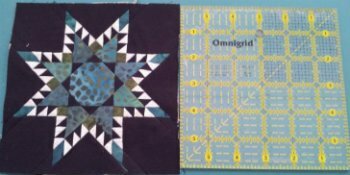 I modified a pattern that has been around for decades and turned it into a quilt as you go technique. The flowers are raw edge applique. 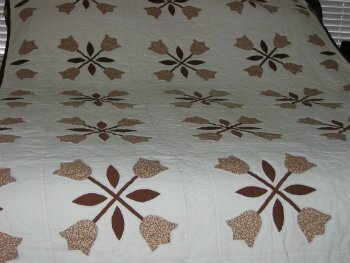 This is an original pattern using the same technique. Click here to order the pattern. 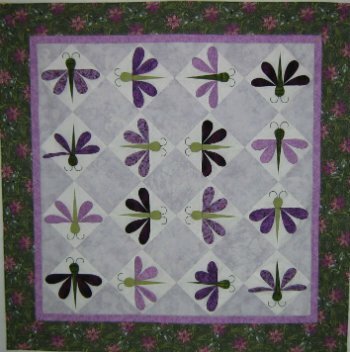 A fun, bold quilt by a Karen Combs pattern. Dimensional applique pattern by Ruth Jensen.